Things have been kind of sad around here. The Friday after I came back from Maryland my sister-in-law,my brother's wife, passed away. She had been battling ovarian cancer for 2 and a half years. She was only 33. My brother and I have always been close. It is only he and I and he is four years younger. It has been heart breaking to watch them go through this and not be able to do a thing. My friends at fibertradition yahoo group have been with me from the first diagnoses. Giving support, love, and prayers. They are an amazing bunch of ladies. One of my fellow fters felt I needed an extra hug and sent me a shawl. It is so beautiful. I am so in love with these colors. They remind me of a cool forest. Thank you Laura! You have a big heart. This came at a great time! the gifts from the heart are always the best aren't they. the shawl fits you perfectly, both in color and style. It's perfect - fit, colour, sentiment. It is perfect, and I hope that you find it comforting. It's lovely. 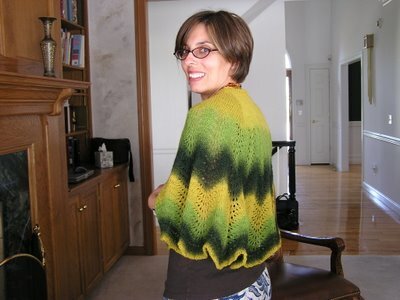 You look lovely in the shawl! And what a warm hearted gift. Laura is the best. Those colors are great on you! What a wonderful gift! The shawl is beautiful! You and your family are in my thoughts and prayers. Hey, it looks great on you! That's the piece Laura was working on at the party, isn't it? What a wonderful gift! I don't have a shawl for you, but you and your family have all my best wishes. my thoughts are with you E, I'm so sorry you all have to deal with this. Please send my condolences along to your brother. Elizabeth, it looks absolutely beautiful on you. What a hug. Have a wonderful time on your trip. We'll miss you when you're gone!